If you like to keep a log on items you own along with information on the date you obtained them, then an inventory list you can use in a spreadsheet program can be helpful. This allows you to easily have the information updated as you enter it every time. You can use the inventory spreadsheet template that is available for free on this page. You can download it and use it to log all your personal items, and track them. The template is easy to use and customize. It’s compatible with Microsoft Excel 2013. Download the free inventory spreadsheet template to your computer, and save it to any folder of your choice or straight to the desktop for quicker access to it. Locate the file for the template and open it to begin customizing it with the information you want. The template has three pages. The first page is the summary for your items. This page will be updated based on the details you enter on the other pages. The second page is the inventory list. Here you can enter the items you own. The columns included are for the name of item, description, type, and date you acquired it. Edit the list with your own information. You can add to the list or delete some of the default ones. The third page is the collection list. Here you will enter the collection types you have. The count will automatically be calculated for you. 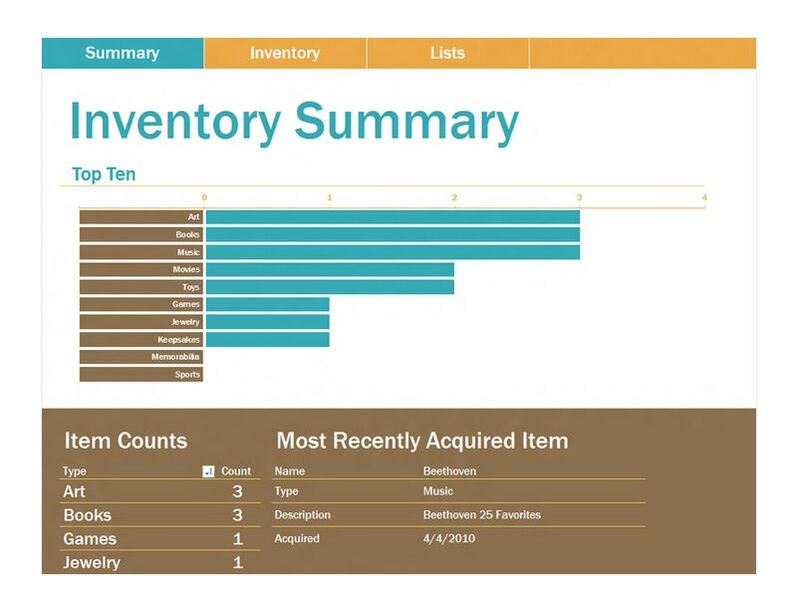 The inventory spreadsheet template can be customized to log and track any kind of collection you want, including items like clothes, shoes and more. You can create a list for everyday items or list only items of high-value. The ideas for having a personal inventory spreadsheet are only limited to your ideas, and what you want to keep track of. The inventory spreadsheet template is a useful list to use. It can help you keep your items organized, and know since when you have owned them. This can also be helpful for items you keep in good condition that you might want to sell to make extra money.